Tell your doctor right away if you have any serious side effects, including: increased thirst, signs of kidney problems (such as change in the amount of urine), mental/mood changes, unusual fatigue/weakness, muscle spasms, menstrual period changes, breast pain, breast enlargement (gynecomastia) in men, sexual function problems, signs of infection (e.g., fever, persistent sore throat), severe stomach/abdominal pain, persistent nausea/vomiting, vomit that looks like coffee grounds, dark urine, yellowing of the eyes/skin, easy bruising/bleeding. This medication may lead to high levels of potassium, especially in patients with kidney problems. If not treated, very high potassium levels can be fatal. Tell your doctor right away if you notice any of the following serious side effects: slow/irregular heartbeat, muscle weakness. List Aldactone side effects by likelihood and severity. Before using this medication, tell your doctor or pharmacist your medical history, especially of: kidney problems, liver problems, untreated mineral imbalance (such as high potassium, low sodium), decreased adrenal gland function (Addison's disease). What should I know regarding pregnancy, nursing and administering Aldactone to children or the elderly? Some products that may interact with this drug include: lithium, drugs that may increase the level of potassium in the blood (such as amiloride, cyclosporine, eplerenone, tacrolimus, triamterene, birth control pills containing drospirenone). 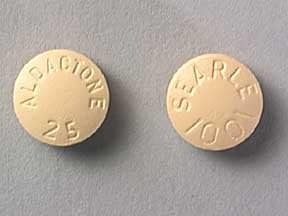 This medicine is a light yellow, round, film-coated, tablet imprinted with "SEARLE 1001" and "ALDACTONE 25". 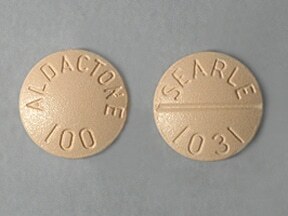 This medicine is a peach, round, scored, film-coated, tablet imprinted with "ALDACTONE 100" and "SEARLE 1031". 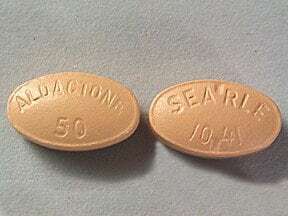 This medicine is a light orange, oval, partially scored, film-coated, tablet imprinted with "SEA RLE 10 41" and "ALDACTONE 50". Are you considering switching to Aldactone? How long have you been taking Aldactone?